The best of both worlds, these flowers are full and showy and have a great scent. You can't go wrong if you want to make a great impression. 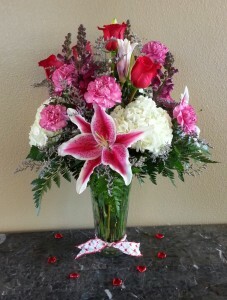 White Hydrangeas,Pink Stargazers Lillies, Red Roses,Pink Carnations, Snapdragons, and Misty Blue in a Large Vase. 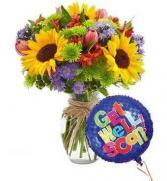 Essence of Europe comes to life in all its grandeur with a bright assortment of alstroemeria, button poms, monte casino, sunflowers and tulips in an elegant clear glass vase. 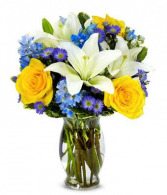 This arrangement includes a variety of flowers and colors - yellow roses, white lilies, blue delphinium and purple Pompons, all in a clear vase guaranteed to stand out.